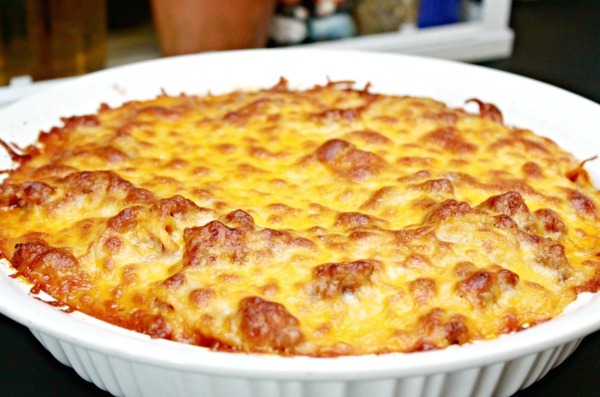 Baked spaghetti pie is my family’s absolute favorite meal all year round. It’s also one of my favorite meals to make because I know that nobody is going to complain about what we are having for dinner, and it’s ridiculously easy to make. I recently posted a pic of my baked spaghetti pie on Instagram (are we following each other on Instagram?) when I made it for dinner a few weeks ago, and people asked for the recipe…I couldn’t believe it! There is no big homemade secret to this dish, just easy ingredients that can be picked up at your grocery store! Cook and drain spaghetti noodles. In a separate pan, brown and drain ground beef. Add spaghetti sauce and warm through. 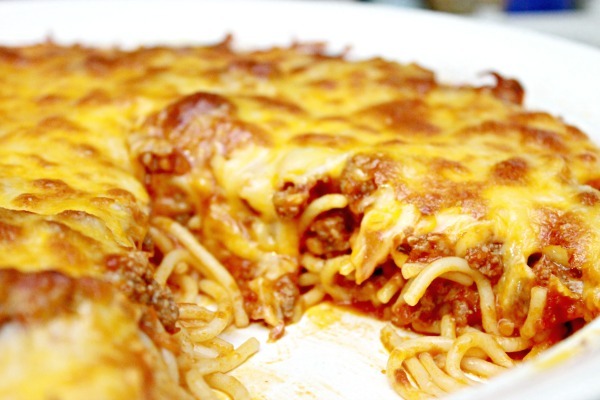 Spray a pie dish or casserole dish with cooking spray, then add spaghetti noodles. Top with sauce and ground beef mixture. Place in oven for around 10 minutes or until cheese is brown on top. I almost feel silly posting this recipe, because it seems so simple, but baking the spaghetti takes it up a notch. It’s sure to be a family favorite and bring every one to the table! This recipe looks vey promising! Just one question… Is this a dish that can be frozen to serve later. Just another perk for convenience! Hi, Nancy! 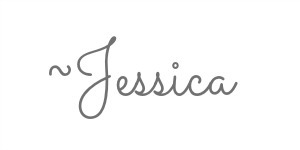 It is one of our favorites for sure…I have never frozen it, but I don’t see why you couldn’t! Thank you soooo much. 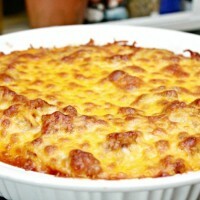 I have been looking for an easy spaghetti pie to make, this is great, cant wait to bake. Can you mix noodles with the spaghetti sauce first before adding it to the baking dish or is it better to keep them in layers? I can’t wait to try out this recipe. Hi, Kevin! I see no reason why you couldn’t :) . It is so good, and one of the few things the whole fam actually looks forward to! I add onion and bell pepper to my meet I’m gonna give it a try and see how’it turns out. I ❤️ Simple recipes thank u so much for Sharing this. Also wonderful to add pepperonis under the cheese before baking!